A two-way communication is going on within us, whether or not we are aware of it. Thoughts affect the body and the body affects thoughts. Just thinking about a previous embarrassment will cause blushing again long after the original incident; having worrisome thoughts may make the hands sweat. On the flip side, physical conditions affect mental functions: being inebriated interferes with better judgment; having a high fever or intense pain can cause delirium. Our physical embodiment and mental enmindedness are the entwined employers of a biological, neuro-chemical system. Lightning fast are our unconscious instincts. We blink as a bug flies toward our eye, we flinch when we witness someone getting hurt, and we freeze if we see a snake. The coordination of such reactions are mediated by the nervous system and happen without our conscious decisions. These instincts can be life-saving, for conscious decision making is too slow and too often erroneous. 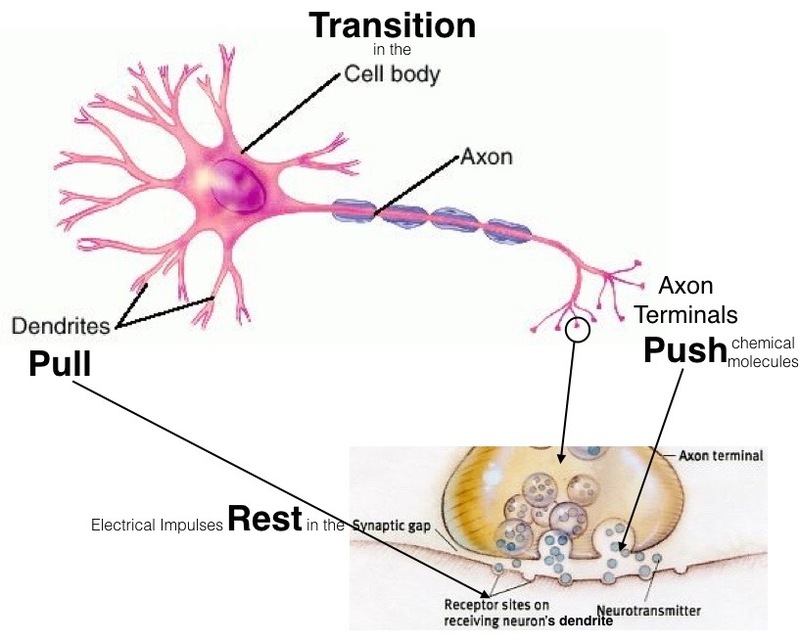 An electrical impulse begins and ends in a nerve cell, traveling linearly from dendrite to axon terminal (left to right in the illustration below). 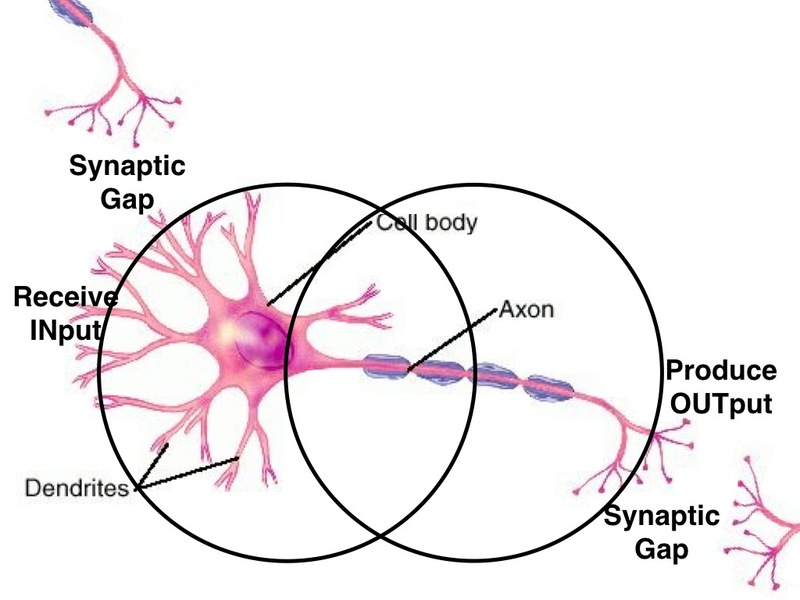 Between the axon of this signaling neuron and the dendrite of a receptive neuron nearby, a small distance called a synaptic gap must be bridged. See the enlargement above. The electrical impulse is confined within the neuron; it cannot jump across the gap to the adjacent receiving nerve cell. Inter-cellular communication must translate between electrical and chemical signals. The sending cell must emit chemical signals, called neurotransmitters, which cross the gap to be received by a neighboring neuron’s dendrite. In the graphic below, we overlay our trusty ‘Pragmatic Schematic‘ onto the nerve cell to highlight its functions. The Pull of its Dendrites and the Push of its Axon terminals are at the opposite extremes. The cell body Transitions between the inward Pull and the outward Push. The nervous impulse travels linearly within the neuron. Outside the neuron, the nervous impulse Rests; in other words, there is no electrical impulse in the synaptic gap. Although we discussed the terms, Pull * Transition * Push * Rest thoroughly in an earlier chapter and in the previous aside, for a brief review PTPR (acronym) in Essential Vocabulary provides a brief description of this sequence which is found ubiquitously in nature’s dynamical systems and incorporated in all Quadernity models. Below, we have symbolically illustrated two adjacent cells. By using the Pragmatic Schematic and omitting the drawing of the cell, we can focus more easily on the functions of the nerve’s parts and the propagation of a nervous impulse across an intervening space. Within the nerves, the linear conveyance of electrical impulses is represented by the horizontal arrows within the neighboring cells. One at a time, a singled-out electrical signal pulses through a particular nerve cell. it is the metaphysical environment in which the cells are integrated, and by which a signal is transmitted between them and propagated on beyond. A diffusion of multiple neuro-transmitters (dots) are released at the axon terminals of nerves to migrate across the synaptic gap. This chemical diffusion is not a one-to-one phenomenon. Whereas communication within a nerve cell is linear, communication between nerves is non-linear. Without the space between them, nerve cells could not propagate nervous signals throughout the body. The nerves exist amidst interstitial tissues and fluids, without which their collective functionality would fail. Neither could we, as agents of our own biosphere, communicate inter-subjectively with other living entities if not for the intermediary spaces in our shared environment. The linearly-strung conscious moments of our individual lives are similarly punctuated by, and resourced by, a transcendent non-linear Consciousness. This may seem strange at first; however, the same two-tiered dynamic occurs every time we communicate with each other. I cannot physically transplant my experiences into your memory; instead our inter-subjectivity is made possible because of what occurs non-linearly in the space between us. When there is communication, a continuum forms between at least two entities. Something non-linear in the gap between entities both differentiates (singles out) and integrates (mingles in) the correspondents. Communication depends on something other than the entities communicating. Consider this: if one wishes to communicate a thought or memory to another person, he or she selects words from a shared vocabulary and enunciates those words, forming vibrations in the air that reach the ears of the listener, who then translates the sounds back into words. If these words are heard accurately and the words spoken are defined by the speaker and the listener in the same way, perhaps the listener may create a mental image and/or an emotional response that is appropriate to the intention of the speaker. Isn’t it amazing that it goes as well as it does, as often as it does? A secondary aside is offered here to further explore The Magic of Human Communication. Between the original ideas of the speaker and what is understood by the listener, there is an Intelligent between-ness, through which singled-out ideas cannot traverse. A thought is singled out by one of us. She expresses her thought, mingling it into the Collective Consciousness. If properly attuned, her colleague will extract from the CC a pattern of vibration that stimulates the same or similar thought within himself. Let us consider the electric wire along which the quantitative, measurable form of an electric message is flashed. But the thought is not in the wire. The wire carries only the measurable form which you can translate into words or even into rhythmic wave forms. But the thought is not in the wire, nor is it in the words. Where is it? It is in the Intelligence which remains forever a part of the invisible universe of space. The thought itself is never created. It is only the form of thought which ever assumes measurable shape. Nerve impulses are singled out within the neurons. Beyond the cells, neuro-transmitters are mingled in with interstitial fluids. Relatively speaking, the cell bodies (singled out) are physical and their fluid environment is metaphysical, transcending and including the physical nerve bodies within it (mingled in). 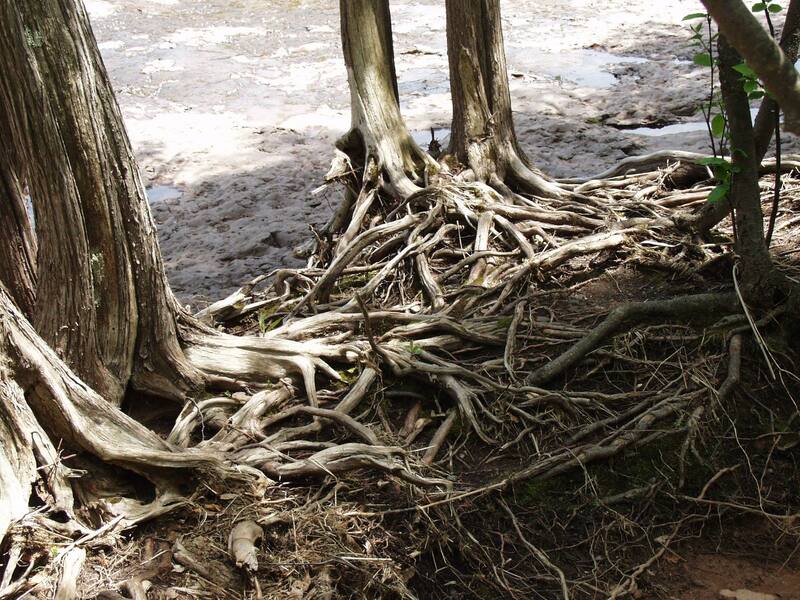 Seen below, a storm has unearthed the normally hidden mass of roots, which reveals a complex underground communication system (mingled-in) between trees (singled-out) in a forest. You are encouraged to watch an amazing video (active link). It is well worth 4 minutes of your time. A female forester explains in the simplest of terms how trees are inter-related, even across diverse species, via a network involving fungi. She even says their inter-relatedness is almost “metaphysical”. 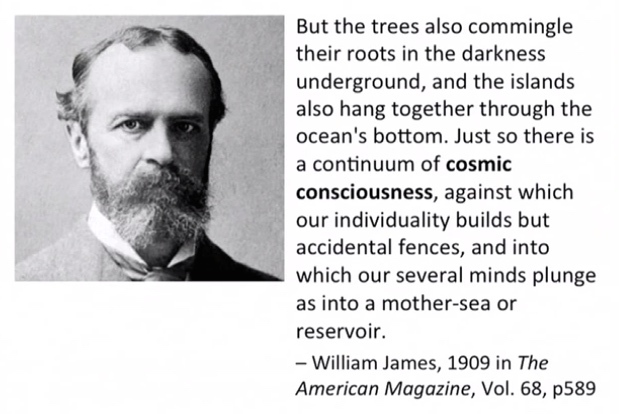 As you watch, you might want to compare the tree roots to dendrites and axons and the roots’ fungi-mediated relationship to what occurs in the synaptic juncture between neurons. Good practice for universal pattern recognition! The linearly-strung physical perceptions of our individual lives are similarly punctuated by, and resourced by, a transcendent non-linear Consciousness. The metaphysical “Cosmic Consciousness” is invisibly mingled-in within and between singled-out physical entities.